Renowned its rugged rocky coastline, spectacular natural scenery, and rich maritime history, northeastern-most U.S. state of Maine offers a wealth of attractions, activities, and beautiful sights. From lobsters and lighthouses to charming resort villages, peaceful harbors, pebbly beaches, and mile upon mile of jagged sea cliffs, Maine is New England at its most iconic. 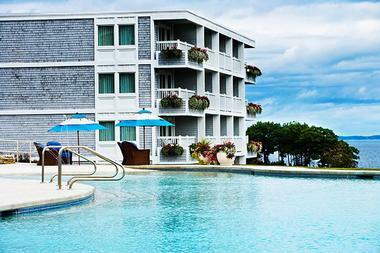 Perched on a cliff overlooking the Atlantic Ocean, The Cliff House Resort is an iconic Maine retreat. Set on 70 acres of pristine oceanfront landscapes on top of Bald Head Cliff, this sprawling resort and spa was built in 1872 and has been captivating guests with its luxury and charm ever since. Located minutes from Ogunquit’s sandy beach and just over an hour north of Boston on the southern coast of Maine, the resort features deluxe accommodations, first-class amenities and facilities, award-winning cuisine, and breathtaking panoramic views. Each of the retreat’s guest rooms and suites is beautifully appointed and stylishly decorated with handcrafted elements and coastal accents and boast en-suite bathrooms and private terraces with incomparable oceanfront views. Deluxe amenities and facilities include four swimming pools, including one adults-only pool, an exclusive full-service spa with an outdoor meditation labyrinth, and a state-of-the-art fitness center with a full range of equipment and classes on offer. An excellent restaurant serves superlative cuisine, and a casual lounge and poolside grill offer a relaxing place for drinks. The Cliff House Resort also features over 25,000 square feet of event space for unforgettable weddings, social gatherings, or corporate retreats, capturing the best of New England in every season. Designed initially as a nine-hole course in 1902, Samoset Resort Golf Course is a classic golf resort set on a spectacular oceanfront property in Rockport. Just a few miles from the center of the city, the plush resort features a 6,600-yard, par 71 18-hole golf course, which has been hailed as one of the most beautiful in New England, with seven holes bordering Penobscot Bay and ocean views from 14 holes. There is also a nine-hole golf course, a high-end spa and wellness center, a beach-like entry swimming pool with a poolside bar, and a variety of sports courts such as tennis, basketball, and volleyball. The resort hotel features beautifully appointed, airy guest rooms with en-suite bathrooms, private balconies, Keurig coffeemakers, iPod docks, mini fridges, flat-screen televisions with cable channels mini-fridges, and complimentary wireless Internet, while cottages have full kitchens with washer/dryers and screened-in porches. A casual Italian eatery offers delicious Mediterranean-inspired cuisine, along with a laid-back grill serving prime steaks, and a wine bar offering fine wines from around the world. Set on a rocky peninsula next to York Harbor Beach and with easy access to the antique shops, historical sites, restaurants and bars of downtown Portsmouth, the Stage Neck Inn is a plush hotel that offers a quiet retreat with spectacular views. 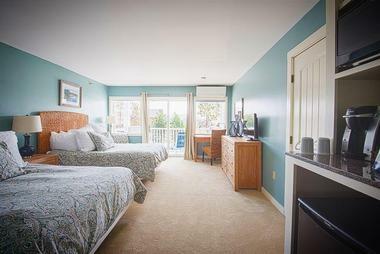 Located a few miles from the famous Cape Neddick Lighthouse, the hotel features well-appointed and individually decorated guest rooms with British Colonial-style furnishings, coffeemakers, mini-fridges and flat-screen televisions, as well as private balconies with harbor or ocean views. A seasonal seven-bedroom cottage is also available for larger groups or families, and dining options include an elegant ocean-view restaurant with a terrace, and a casual grill and bar. Other hotel amenities include a day spa offering massages and body treatments, a fully equipped gym, an indoor swimming pool and a hot tub, as well as a seasonal outdoor swimming pool, and tennis courts. 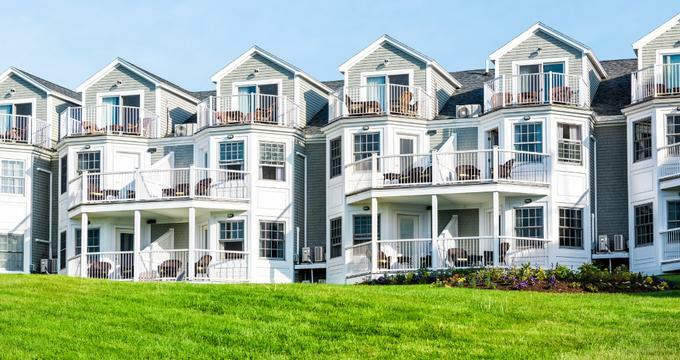 Ideally located for enjoying the beach, shops, and attractions of Kennebunkport, the Nonantum Resort is a refined, riverfront resort just a short walk away from Dock Square in the heart of the town. Established in 1833, the historic resort is home to a marina from which a scenic lobster boat tour departs every day, along with an outdoor heated swimming pool, three casual restaurants, and plenty of activities for the whole family to enjoy. 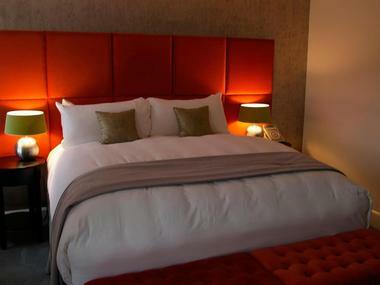 Polished guest rooms have en-suite bathrooms, balconies with beautiful views and modern amenities such as flat-screen televisions with cable channels mini-fridges, and complimentary wireless Internet. Upgraded deluxe suites have spacious living areas, en-suite bathrooms with whirlpool tubs, and additional bedrooms for extra guests. Bikes and kayaks can be rented for exploring the surrounding area, and activities on offer range from yoga, cooking demos, and sand sculpting. 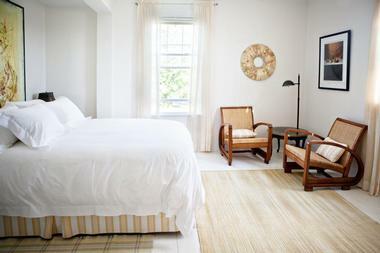 Camden Harbour Inn is a luxury bed and breakfast on the rugged coast of Maine. 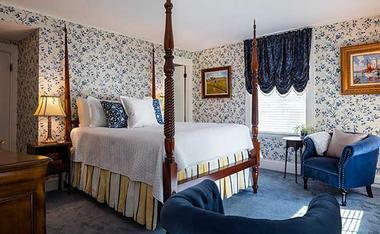 Hailed as one of New England’s most exclusive boutique hotels, the historic inn offers a unique blend of luxurious accommodation with breathtaking views, indulgent amenities and gourmet cuisine at an award-winning restaurant, and gracious hospitality to create a memorable experience. Camden Harbour Inn offers a range of luxurious and beautifully appointed accommodations with plush king or queen-size beds in designer linens, en-suite bathrooms with soaking tubs, walk-in showers, thick bathrobes, and Molton Brown toiletries, and spacious living rooms with designer furniture and fine art, fireplaces, and modern conveniences. 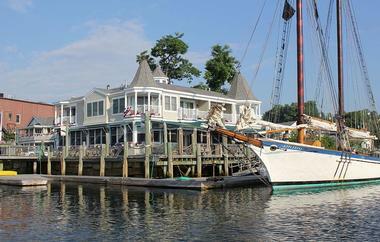 Natalie’s at the Camden Harbour offers an unrivaled dining experience. Boasting spectacular panoramic views of Camden Harbor and Penobscot Bay, the award-winning Natalie’s blends European style with the inviting spirit of New England and serves a creative menu of modern New England cuisine. Tucked away in the heart of Kennebunkport in Maine, the Captain Lord Mansion is a romantic bed and breakfast escape that will leave lasting memories. Beautifully appointed rooms and suites are decorated in luxurious, ornate furnishings with romantic four-poster beds, plush linens, comfortable living spaces and lovely en-suite bathrooms with indulgent bathtubs, large showers, and deluxe bath products. Sumptuous homemade country-style breakfasts are served every morning, where freshly brewed coffee accompanies organically farmed eggs, steaming pancakes with Maine maple syrup, and freshly squeezed orange juice. After breakfast, unwind with an indulgent spa experience in the comfort of your room as you relax in absolute tranquility. Overlooking the meandering Kennebunkport River, the Captain Lord Mansion is situated just three short blocks away from Dock Square and is surrounded by an array of 17th and 18th century Colonial and Federal period homes. Set in a stately 1920s building overlooking the North Atlantic Ocean, Chebeague Island Inn is a deluxe hotel that offers an idyllic island escape. Initially built in the 1880s as The Hillcrest Hotel, and later rebuilt in the 1920s as the Chebeague Island Inn, the beautifully appointed hotel boasts breathtaking views of the ocean. Set on Chebeague Island, one of Maine's most beautiful islands which is a few hours north of Boston and accessed by ferry, the hotel features well-appointed guest rooms with en-suite or shared bathrooms, sitting areas with daybeds (suites) and modern amenities. The Inn has an upscale eatery that serves seasonal, local cuisine, a complimentary hot breakfast and afternoon snacks are offered daily, and a great common room has comfortable seating and a large fireplace where guests can relax. The Chebeague Island Inn is ideally located for exploring the island, which is within easy access to several beautiful beaches, including Bar Harbor, Portland and Old Orchard Beach, and a variety of activities and attractions. 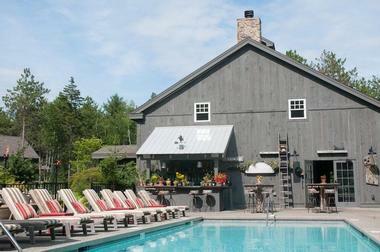 Hidden Pond is a secluded, rustic-chic resort spread across several wooden chalet-style buildings that offers a fabulous Kennebunkport retreat. Close to Goose Rocks Beach, and the 19th-century Goat Island Lighthouse, the resort features quaint two-bedroom cottages with living room with flat-screen televisions, gas fireplaces, kitchens with washer/dryers, and screened-in porches with lovely views. Guests can enjoy a refined dining experience at a posh farm-to-table restaurant followed by drinks at a relaxed bar, as well as pampering massages and body treatments at a unique treetop spa. Other amenities include two outdoor heated swimming pools, loaner bikes for exploring, a fire pit for alfresco evenings under the stars, and arts and crafts classes. 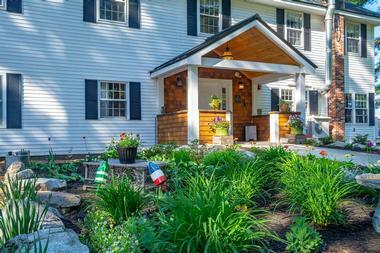 Situated in a leafy spot close to the Kennebunk River, the Grace White Barn Inn & Spa is an elegant inn set in a former farmhouse that offers a tranquil and serene retreat in the heart of Kennebunk. Located just two miles from the Cape Arundel Golf Club and a short walk from Gooch's Beach, the hotel features bright and airy country-style rooms and cozy cottages with en-suite bathrooms, whirlpool tubs, and rainfall showers, sitting areas with fireplaces, flat-screen televisions with cable channels, and private patios with beautiful views. Amenities at the Inn include an upscale restaurant and a relaxed bistro serving globally inspired cuisine, a luxurious day spa, and private marina, loaner bikes for exploring, and cooking classes for keen guests. Resting on the edge of a scenic harbor in the coastal village of Camden, the Grand Harbor Inn is a small and sophisticated boutique hotel designed for discerning business and leisure travelers. The only award-winning hotel in the area, the Grand Harbor Inn celebrates the history and tradition of New England coastal cottage architecture with Coastal Cottage, shingle-style architecture and Tuscan-inspired interiors, evoking a charming, old-world ambiance. Open year-round, the Grand Harbor Inn features luxurious accommodations, world-class amenities, and exceptional guest services to offer an unrivaled and unforgettable experience. Resting atop Chase Hill, just steps away from bustling, downtown Kennebunkport, the Grand Hotel in Kennebunk is a beautifully appointed retreat with classic New England architecture and elegantly appointed décor. Boasting beautiful views of the vibrant Dock Square and Lower Village, the Grand Hotel features charming guest room and suites decorated in soothing tones of saffron, cream, and silver with contemporary furnishings, marble en-suite bathrooms and modern amenities such as air-conditioning, flat-screen televisions with cable channels, and Keurig coffee makers. The hotel features a carefully curated art collection with a variety of exhibits throughout the hotel and upscale amenities include complimentary parking, beach towels and chairs, beach cruiser bicycles, free kayak, canoe, and stand-up paddleboard rentals, and a guest pantry stocked with snacks, bottled water, forgotten toiletries, magazines and books to lend. Overlooking Boothbay Harbor, the Harborage Inn on the Oceanfront is a quaint family-run bed-and-breakfast that is situated a few miles from the 250-acre Coastal Maine Botanical Gardens and the Maine State Aquarium. Established in 1925, the charming inn features warmly decorated guest rooms and suites decorated with antiques and floral-patterned furnishings, electric fireplaces, coffeemakers, mini-fridges, whirlpool tubs, and private decks with panoramic harbor views. Upscale amenities at the Inn include a seven-person hot tub and large covered porch with rocking chairs and tables, and a complimentary breakfast is served seasonally every morning. 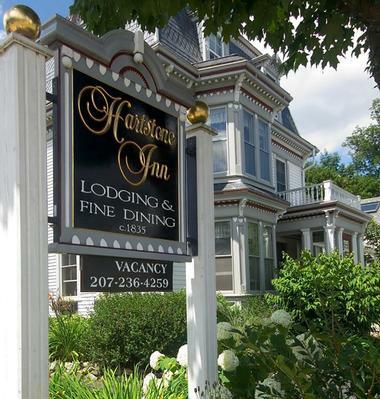 Exuding classic Maine style and warm hospitality, the Harraseeket Inn is a luxurious, family-owned country inn in the small village of Freeport. Boasting two fantastic restaurants, comfortable accommodations and a range of outdoor activities to enjoy, this relaxed, award-winning hotel promises an unforgettable stay. Guest rooms are beautifully decorated with lavish antiques, romantic four-poster beds, spacious en-suite bathrooms with whirlpool baths, and some rooms enjoy cozy wood-burning fireplaces. 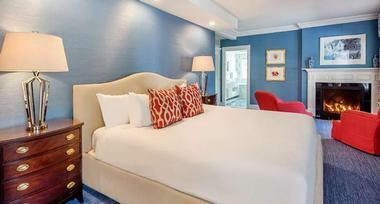 Imported linens, plush terry robes, and deluxe bath products add a special touch. The hotel features two outstanding restaurants – The Maine Harvest Dining Room and the Broad Arrow Tavern – both of which serve delicious, handcrafted fare and superb wines in an elegant setting. Freeport has much to offer in the way of sightseeing and exploring – enjoy world-class shopping, wonderful museums, and galleries, or head outdoors for scenic whale watching cruises, hiking and mountain biking, fishing and golf. 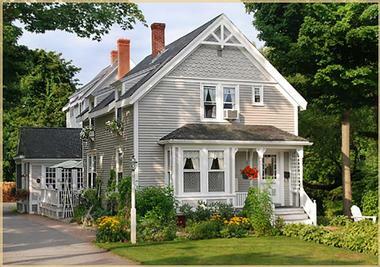 Built in 1835, the Hartstone Inn & Hideaway is a historic Mansard-style Victorian bed and breakfast in Camden, Maine. Located in the heart of the village, the award-winning retreat offers elegant and refined accommodations with private en-suite bathrooms, modern amenities and private gardens with lovely views. Suites add spacious living areas with fireplaces and whirlpool tubs, and a complimentary gourmet breakfast is served every morning. Stylishly decorated common areas feature a collection of over 400 orchids, hors-d'oeuvres and drinks are offered in the afternoons and guests can enjoy added extras such as cooking classes and spa services for an additional fee. 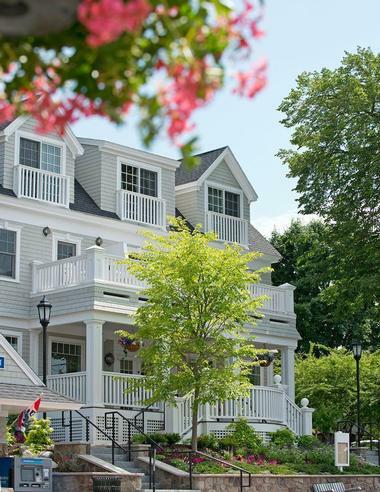 The Hartstone Inn & Hideaway is ideally located for exploring the seaside village of Camden, which offers a host of activities and attractions such as hiking, biking, and kayaking to world-class golf courses, art museums and galleries, and boutique shops. 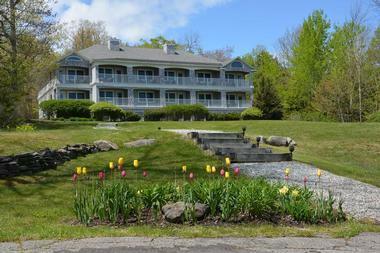 Set on five acres of beautifully landscaped grounds along the shores of Penobscot Bay, the Inn at Sunrise Point is an upmarket bed and breakfast that offers elegant accommodations, gourmet cuisine, and breathtaking bay views. Located a few miles from Camden Harbor and the forests of Camden Hills State Park, the inn boasts airy, stylishly decorated guest rooms and deluxe suites in the main house and an annex. All lodgings have en-suite bathrooms with soaking tubs and walk-in showers, sitting rooms with fireplaces, and conveniences such as microwaves, wet bars, coffeemakers, mini-fridges, flat-screen televisions with cable channels, and complimentary wireless Internet. A delicious gourmet breakfast is served every morning in the sunroom, and a wood-paneled library with a fireplace is an ideal spot to relax in the evenings. A short walk from Crescent Beach and just eight miles from the foodie capital of the state, Portland, the Inn by the Sea is an upmarket hotel with well-appointed and warmly decorated accommodations, a full-service spa, and a fine dining restaurant with an outdoor deck and panoramic beach views. Ocean-facing guest rooms boast local artworks, en-suite bathrooms, work desks and chairs, and modern amenities such as flat-screen televisions with cable channels, mini-fridges, coffeemakers, and gas fireplaces, while deluxe suites enjoy separate living areas, kitchenettes or kitchens, and private balconies or patios with lovely views. A luxury spa provides pampering massages and treatments, a garden fire pit is perfect for evenings under the stars, and a seasonal activity program for kids and adult keep guests busy. Set in a beautifully restored 1890 Victorian home, James Place Inn is a charming bed and breakfast with comfortable accommodations, home-cooked gourmet cuisine, and a warm and welcoming ambiance. The Inn features well-appointed and individually decorated guest rooms with four-poster beds, en-suite bathrooms, whirlpool tubs, kitchenettes, fireplaces, and private decks with gorgeous views. In-room conveniences include flat-screen televisions with cable channels, handmade toiletries, and complimentary wireless Internet, and a delicious full breakfast is served in the dining room or out on the deck every morning. Afternoon snacks are offered, and a DVD library is available for guests to use. James Place Inn is located a few miles from both the Bradbury Mountain State Park and the beautiful beach at Winslow Memorial Park. Press Hotel is a unique hotel in Portland's Old Port District, conveniently located near top city attractions such as the Portland Art Museum, the Wadsworth Longfellow House, and the Victoria Mansion. 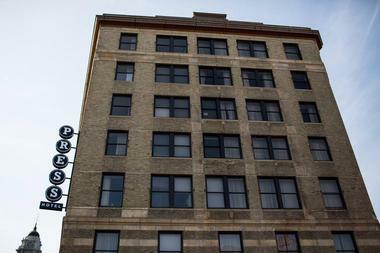 The hotel is housed within the former headquarters of the Portland Press Herald, which operated out of the Gannett Building until 2010, with each guest room adorably styled as a 1920s writer's office with vintage desks and design elements. The newspaper's former city room has been repurposed as the Inkwell Coffee Shop and Bar, which serves up coffee shop beverages, vintage-style cocktails, and craft microbrews from Portland-area breweries. Other newspaper-related artifacts can be found throughout the hotel, including a former newsprint scale that has been repurposed for use within the hotel's fitness center. 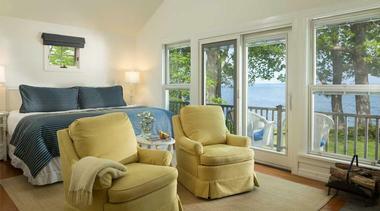 Boasting beautiful views over Frenchman's Bay, the Bayview is a traditional hotel in Bar Harbor with spacious guest rooms and balconies overlooking the ocean. Located a short way from downtown Bar Harbor and the Acadia National Park, the charming seaside retreat features well-appointed guest rooms with microwaves, mini-fridges and complimentary wireless Internet, deluxe suites with pull-out sofas, and two and three-bedroom townhouse units with fully equipped kitchens, living and dining rooms, and electric fireplaces. A delicious continental breakfast is served every morning, along with afternoon cookies and an outdoor swimming pool is a perfect place to soak up the sun. Built in 1874 and surrounded by three acres of beautifully manicured gardens and grounds, the Captain A.V. 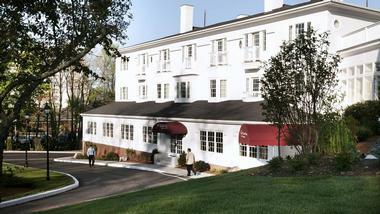 Nickels Inn is a grand inn with elegant Old-World rooms and suites and beautiful ocean views. Located on the Main Road in Searsport and a short walk from the Penobscot Marine Museum, the charming hotel boasts stylishly appointed guest rooms with antique furnishings, hardwood floors and original artworks, en-suite bathrooms, coffeemakers, mini-fridges and flat-screen televisions, and complimentary wireless Internet. A complimentary cooked breakfast is served in the conservatory every morning, and cheese and wine events are held in the guest lounge in the evenings. A formal dining room and a casual restaurant serve delicious homemade fare and two sitting rooms, a library, and a Bayview loggia offer relaxing spots to unwind. Located steps from the beautiful Bowdoin College campus in Brunswick on the banks of the Androscoggin River, The Daniel is a lifestyle luxury hotel with stylish accommodations, gourmet cuisine, and unrivaled hospitality and service. Built on a historic site dating back to 1819, the hotel was Captain Daniel Stone Inn before being reimagined into a sleek hotel with well-appointed guest rooms and suites featuring en-suite bathrooms with rainfall showers, whirlpool tubs and designer toiletries, spacious living areas, and modern in-room amenities such as coffeemakers, mini-fridges and flat-screen televisions, and complimentary wireless Internet. The hotel's Coast Bar + Bistro provides excellent cuisine, libations, and entertainment in a relaxed atmosphere, and upscale amenities include an exercise room, a sauna, and a business center. Built in 1860 as a dairy farm and based on a 19th-century Greek Revival-style property in coastal Kennebunk, The Inn at English Meadows is a chic bed and breakfast inn that has been beautifully restored to its former glory to offer a stylish and elegant seaside retreat. Located a short walk away from the antiques shops, galleries and restaurants of Dock Square, the hotel features airy and modern individually decorated guest rooms and suites spread across the main building and a lovely carriage house, with en-suite bathrooms, whirlpool tubs, designer toiletries, gas fireplaces, and modern amenities such as c espresso machines, iPod docks, flat-screen televisions, and complimentary wireless Internet. A three-course gourmet breakfast is served every morning in the dining room or on the patio, along with afternoon snacks. Resting on the Western shore of picturesque Penobscot Bay, The Inn at Ocean’s Edge is a serene retreat that lies between the sandy curve of Lincolnville Beach and the historic port of Camden. Exuding an ambiance quintessential to Maine, the oceanfront boutique hotel features luxurious accommodations, first-class amenities and facilities, gracious hospitality, and spectacular views of the ocean. Situated in the heart of Camden Village, The Inn at Ocean’s Edge is ideally located within close proximity to the many quaint shops and bustling harbor, the vibrant artist colony of Belfast and the beautiful sandy beaches of Lincolnville. The Inn at Ocean's Edge offers an array of first-class amenities and guest services, including exclusive spa services at the Poolhouse Spa, which features two massage rooms, a hot tub, and a cedar sauna, and a heated outdoor infinity edge swimming pool with sundeck and outdoor fireplace. The Inn’s pub and lounge offer an ideal spot for an early evening drink by the crackling fire or on a lounger in the outdoor lounge area overlooking the picturesque Penobscot. Surrounded by pristine woodlands on the shores of Tripp Lake, Wolf Cove Inn is a secluded bed and breakfast inn with easy access to excellent hiking and fishing at the Range Pond State Park. The charming inn features warmly decorated guest rooms with traditional furnishings, pull-out sofas, fireplaces, and en-suite bathrooms with whirlpool tubs. Suites have spacious living rooms and mini-fridges, and all accommodations offer modern in-room conveniences such as flat-screen televisions with cable channels, and complimentary wireless Internet. A gourmet three-course breakfast is served in the dining room every morning against a backdrop of beautiful lake views, and cheese and wine socials are hosted on the weekends. A sunroom and a comfortable lounge offer laid-back places to relax and a beautiful garden is the perfect spot to unwind. Set on the Kennebunkport River, the Breakwater Inn & Spa is a casual hotel dating back to the 1880s with a modern annex that houses beautifully appointed accommodations, modern amenities, and gracious hospitality. The hotel features bright and airy guest rooms and suites with nautically-inspired décor, spacious sitting areas with flat-screen televisions with cable channels, mini fridges, complimentary wireless Internet, and lovely river views. A delicious continental breakfast is served every morning, along with afternoon tea, and a refined seafood restaurant serves New England cuisine against a backdrop of beautiful river views. Additional amenities include a spa and a fitness room, and loaner bikes for exploring and the hotel is a short drive away from Gooch's Beach and the Rachel Carson National Wildlife Refuge.